Four EASY Sensory Activities Kids LOVE! Watch and observe how your children/students play with each sensory activity you set up, encourage their creative thinking skills by asking them others possible ways they could play with that sensory, they might surprise you with a great idea. Also, don’t be afraid to alter it, The goal is to keep them engaged and having FUN!! 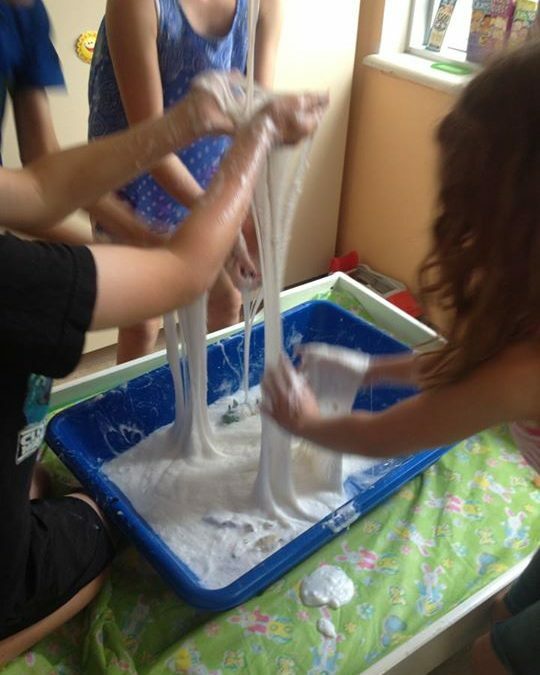 Goop is extremely easy to make, children will sit for hours playing with this stuff.. to be honest, Adults enjoy it too. Whenever we make it in our classroom the kids are fascinated with how it goes from a solid, to a liquid, and back to a solid after running your hands through it. It is great for keeping them busy! I love how this sensory can be altered by simply changing the colour of the noodle. Children who prefer a dry activity would enjoy playing here (unless you add too much oil). Set up chopsticks, spoons and extra bowls to promote fine motor skills. You can even add a scale to make it educational. Depending on the age group, this activity can be made challenging by incorporating a tracking sheet for them to document how many noodles it takes to balance out the scale, and what the results are. Bring water to a boil, add noodles and cook until soft. Drain and mix oil to the noodles. Let it cool down before use. If you want coloured noodles, add the food colouring with the oil. It’s amazing how this 1 product is so much fun to play with; you can substitute shaving cream with Whipped cream to make it edible for younger age groups. To change this activity, just add Material that fits your theme, for example (bugs, waterproof action figures, marbles, zip lock bags or measuring cups). 4 more Easy and fun sensory activities will be posted soon! !